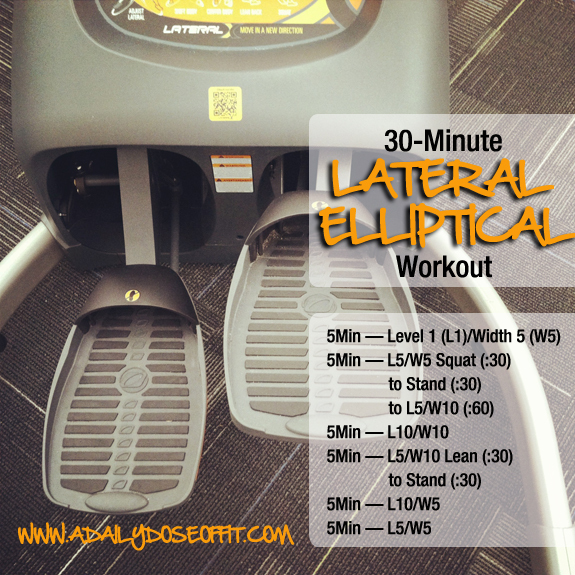 It's no secret that I am loving the lateral elliptical right now. I'm inching closer and closer to a pregnancy induced break from running, so I've been taking to this awesome piece of cardio equipment on occasion to continue challenging the heart and lungs (and legs) as best I can. FYI, this is not a sponsored post. The thing about cardio and leg work...it tends to be very forward/backward. Translation: We always run or walk forward. We squat or do leg extensions, and everything is perfectly aligned to move in front of or behind us. There's nothing wrong with this, per se, except that life isn't front or back. Life is an all-around thing. We move in every single direction, so we need to start training in every single direction, too. Step on the lateral elliptical and you'll do just that. I did a 30-minute lateral elliptical workout this morning and it turned my legs into jelly. Is there a better feeling? No, not in my book because I have such a hard time pushing my legs to their limit! I decided to capture the workout for you in this pinnable image, just in case you have a lateral elliptical at your gym. Remember, what works for me may not work for you. Use the above as a guideline and always be true to your body and your fitness. And, at the very least, consult with your physician if elliptical work is completely new to you. Question: What is your LEAST favorite piece of cardio equipment? Why? i LOVE the elliptical! my doctor didn't want me doing it during pregnancy because of all the bouncing, so i'm def looking forward to getting back to it after!! Postpartum Fitness: What should you expect?